Glass and Stainless offers a professional design service to help customers who are unsure about what they can achieve and to get the best finish and design within their budget. Designing and installing your project can be left to us, just simply send us your sketches, photographs or technical drawings and we will help you turn your vision into a reality. Our extensive experience and professional designers can help cut through any issues such as building shape and positioning of doors, windows and stairways thus making sure that the finished product is fit for purpose as well as looking great. It’s not always easy to envisage exactly what can and cannot be achieved within a given space, but Glass and Stainless offer a unique design service to help. Using our designers also helps to make sure that the job is done on time and within budget by overcoming any potential concerns within the design phase. By utilising Glass and Stainless’s design skills the project will end up with a much more robust design that is tailored to suit not only budgets and timeframes but also quality and aesthetics too. 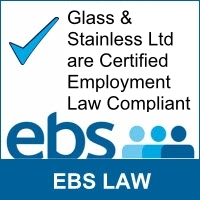 If you would like to discuss how Glass & Stainless Ltd can help in the design and planning of your project such as your bespoke glass design, balustade design or architectural Staircase project don’t hesitate to contact the team.